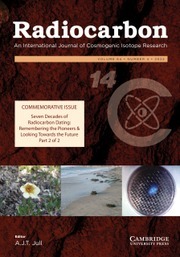 Radiocarbon is the international journal of record for technical and interpretive articles and date lists relevant to 14C and other radioisotopes and techniques used in archaeological, geophysical, oceanographic, and related dating. Since it was founded in 1959 Radiocarbon has published many seminal works and is typically the venue for the triennial International Radiocarbon Conference proceedings. The journal also publishes occasional special issues. Submissions are welcome for regular articles in the form of research reports, technical descriptions and date lists, as well as comments, letters to the editor, book reviews and laboratory lists.